17 May 2015, Vehicles On Watch (VOW) is a project that partners residents with in-vehicle cameras with the police to keep the neighbourhood safe. These cameras act as additional “eyes” in the community; participating residents in VOW may be approached by the Police for footage from their in-vehicle cameras for the purpose of investigations. To date, about 760 vehicle owners with in-vehicles cameras are on board VOW, across 56 car parks in Bedok, Changi, Geylang, Marine Parade, Pasir Ris and Tampines. The Cars@Expo is the biggest one-stop car-mart event in Singapore. This event will be held on 25 & 26 April 2015, 10am-8pm at Singapore Expo Halls 3&4. 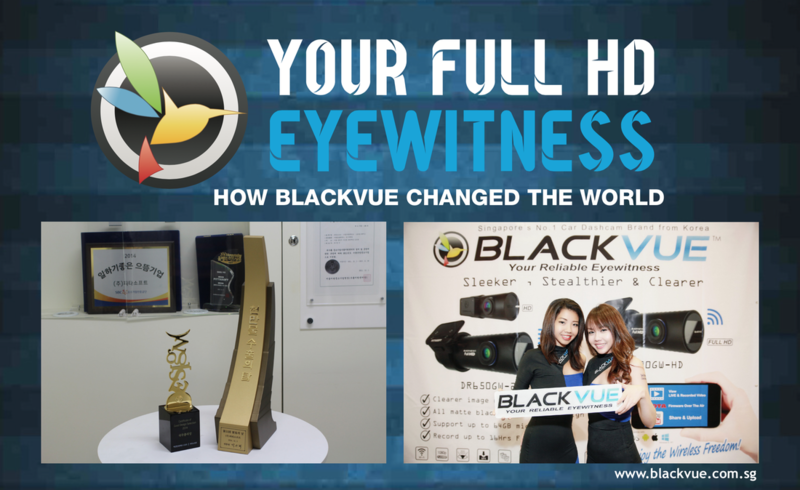 Come and witness the latest BlackVue products with the best deals and promotions. We are located at Booth C22 Hall 4. See you there! 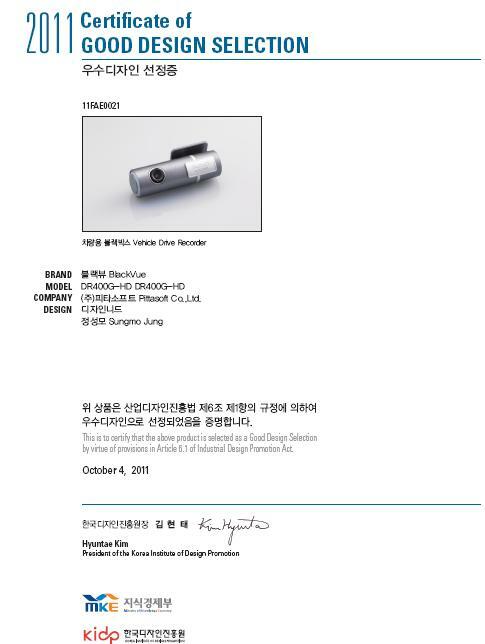 The Vue Beyond, is an event with invited guest from Pittasoft, Korea, the manufacturer for BlackVue car dash cam, local sole distributor, Wow! Gadgets as well as authorised dealers and partners for BlackVue in Singapore. Held on 29 March at Republic of Singapore Yacht Club of about total of 70 guests who present. Guests were introduced with the latest product, BlackVue DR650GW-2CH truck and the upcoming products. Pretty models were also on hand to flank the brand new products, BlackVue DR650GW-2CH Truck. Lucky draw winners for BlackVue Prosperity Draw were picked during the event. Certificates for the authorised dealers were presented on stage to the dealers. 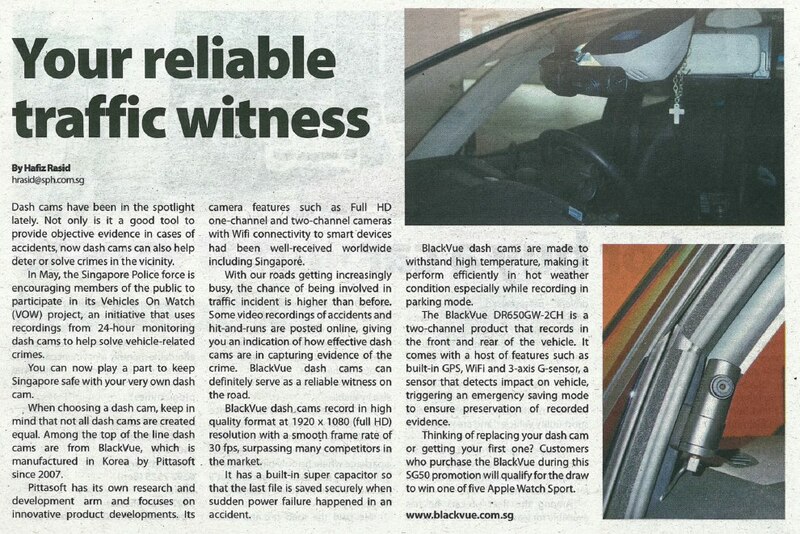 BlackVue DR650GW-2CH was featured as one of the best dash cams in Australia. Introduction of our BlackVue Bike SC300 and Sport SC500 at Big Splash, East Coast Park. Motorbike stunt by Hiroyuki Ogawa from Japan with BlackVue Sport camera. BlackVue collaborated with Lotus Singapore to be one of the co-sponsors at the event. We showcase the latest BlackVue Bike SC300 and other car dash cams at the event. BlackVue Year End Lucky Draw winners were picked during our "Let's Vue Together" event on 16 Feb 2014. Winners had been notified and prize collection will be arranged soon. 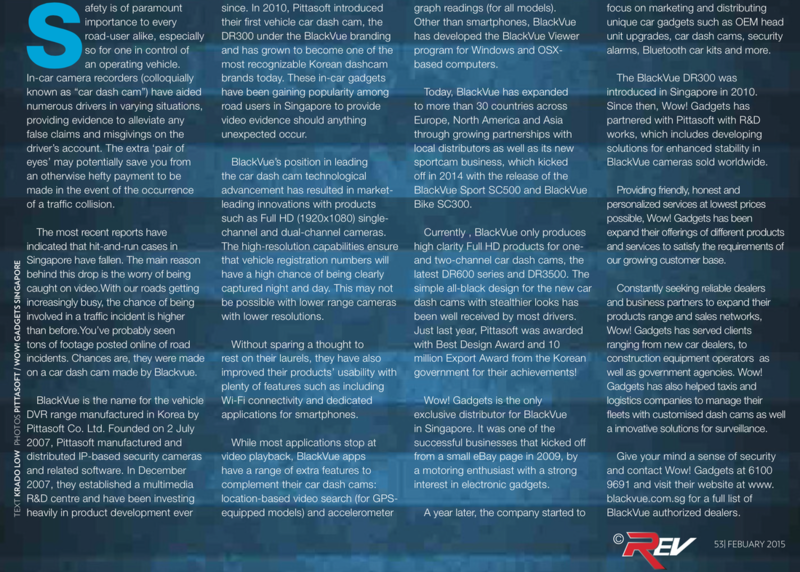 Article: Why many had chosen BlackVue? Held on 16 FEB 2014 at the swanky One Degree 15 Marina, the invitation-only event saw guests from Pittasoft, the Korean manufacturer for BlackVue cameras, local distributor, Wow! Gadgets, as well as all the BlackVue authorised dealers. With host of the day being Jeff Goh, Yes 933 FMs DJ, the event kicked off with a traditional toast for all who were present. Guests were also treated to an eye-opening magic show by Jeremy Tan, a renown Singaporean magician. Needless to say, beautiful models were also on hand to flank the brand new products, BlackVue DR530W-2CH and BlackVue Sport SC500. 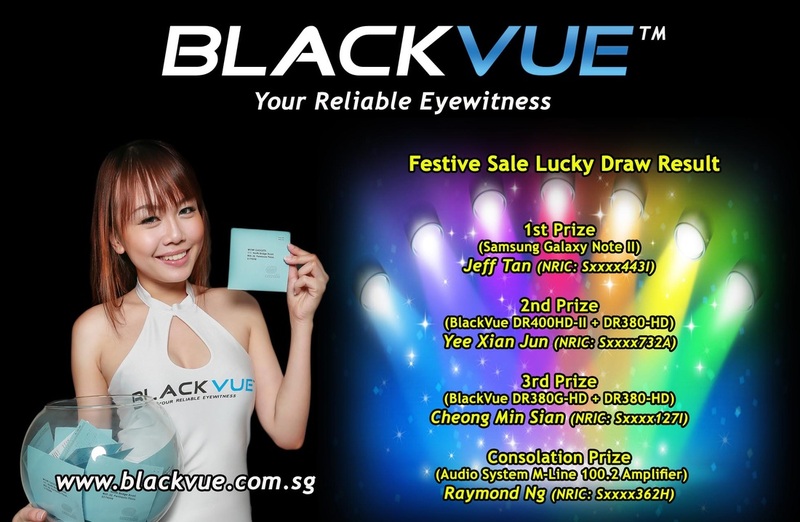 Lucky draw winners for BlackVue Year End Promotion were picked during the event. Initial 2nd Prize winner, Yee Xian Jun did not response to us for the prize collection hence we had redrawn a new winner, Mr. Matthew Michael Tay. Thank you everyone for participating in the “BlackVue Festive Sale Lucky Draw! Congratulations to the lucky winners!! Good news for Mac user, we had released the Viewer software for Mac OS! You can download the application from the link here. "Everything your Toyota needs for a makeover"
A one day event organized by Borneo Motor for their invited customers. We promote BlackVue camera and T-Power C Mobile Power Station during the event. BlackVue also support the auction event for charity to Singapore Children's Society. Please make sure your unit has the Original Label as per attached image. We would like to recall the units with the serial numbers stated. Kindly contact us soon. Thank you for the attention! Thank you for the purchase and reviews for our Best Seller in July/ August 2012, DR380G-HD. Our latest BlackVue Premium HD (DR380G-HD) was launched on 8 July 2012 at the CATS Carnival in Singapore Expo Hall 5. At the same time, T-Power C Battery Pack was introduced as an option to BlackVue for parking mode application. Hiromi Kajikuma aka Hirorin from Japan, is the only female drifter in Formula Drift Singapore 2012 and our BlackVue product ambassador. Her drifting actions was recorded with BlackVue Full HD in car camera @ 1920 x 1080 30fps. BlackVue is proven to record clear and smooth video quality, even we prove it again in drifting competition! The launching of the new Toyota 86 and Prius in Korea, featuring the BlackVue products and models. Super Import Nights is the ultimate motor show in Singapore, featuring local and import models, babes, cars, products and more. We took this opportunity to promote BlackVue products during this show. We are glad with the response and would like to thank you for the support and visit to our booth! 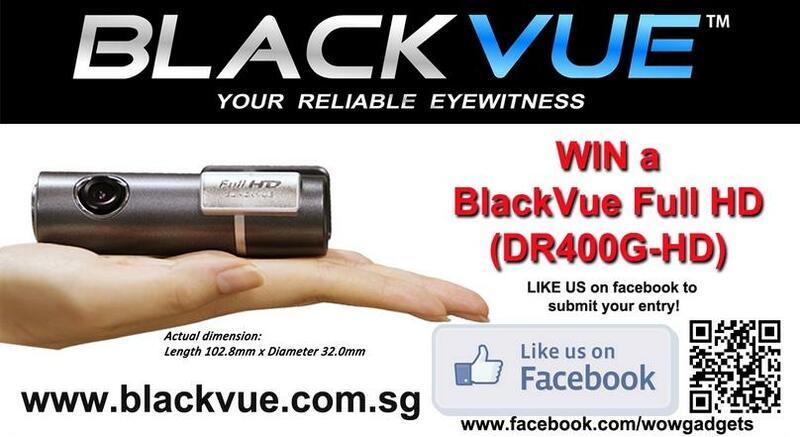 Win a BlackVue Full HD, simply LIKE US on facebook to submit your entry. Thanks to SPH Magazines Pte. 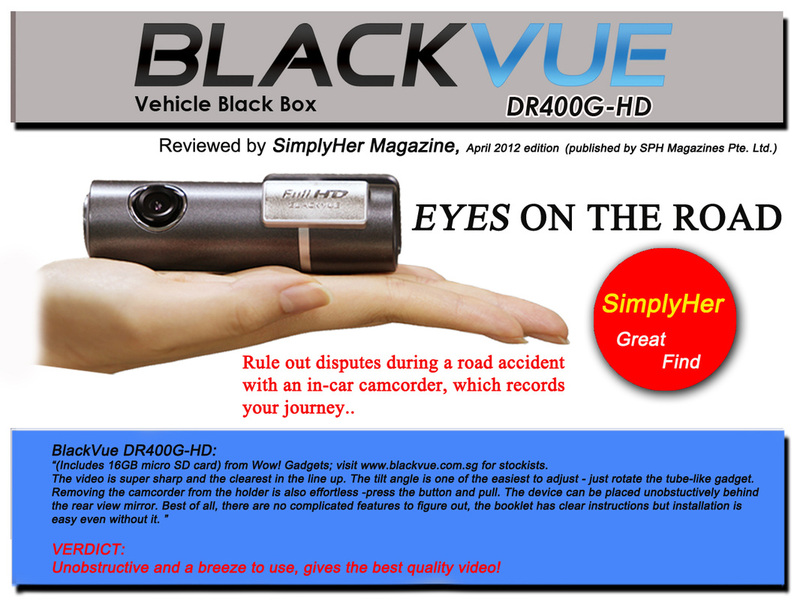 Ltd for the great review of our BlackVue DR400G-HD in their SimplyHer Magazine for April 2012 issue. 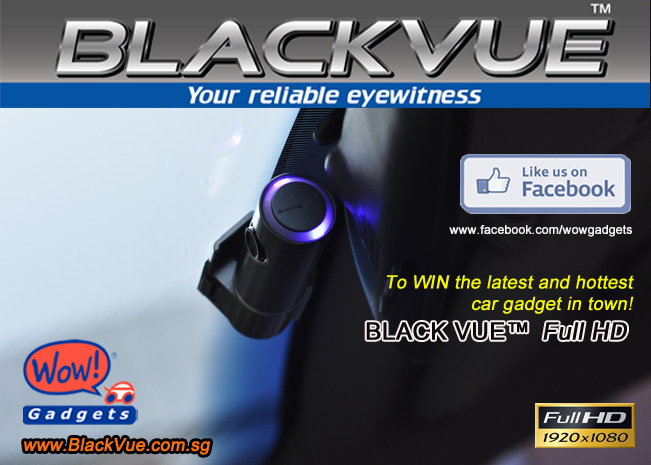 Congratulations to Mr. Benedict Ng, the lucky winner for the Black Vue Full HD Sweepstakes on facebook in November 2011. Like "US" on facebook, you will notified instantly for any new products, promotions and chances to win prizes. For mobile device's user, please use this link. 1) ONLY for residents in Singapore. 2) You must be at least 18 years old. The Black Vue Full HD is finally here. Officially launched on 01 October 2011 in Singapore. The best natural image reproduction with 1920x1080 @ 30 fps. 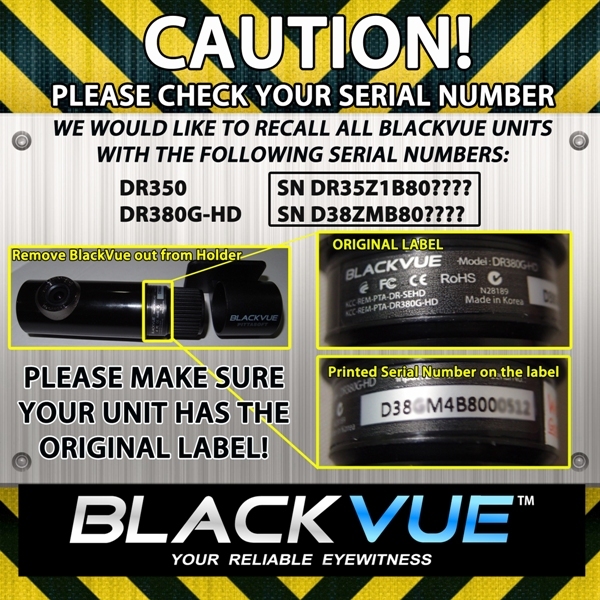 Black Vue is considered one of the smallest vehicle black boxes available but it has other unique features that sets it apart from others. This bi-annual event was held at Singapore Expo from 1st to 3rd July 2011. "Your Reliable Eyewitness........", no doubt, many visitors were surprised with the compact size of the recorder but comes with many features unseen with other competitor products. At the show, we are promoting the importance of vehicle black box in our daily motoring and with Black Vue, it can securely protected your vehicle during driving and parking. Thank you for the support and visit to our booth during the show!